Vijay K. Varadan currently holds the 21st Century Endowed Chair in Nano- and Biotechnologies and Medicine and is Distinguished Professor of Electrical Engineering and Distinguished Professor of Biomedical Engineering (College of Engineering) and Neurosurgery (College of Medicine) at the University of Arkansas, USA. He is also the Director of the Institute for Nano-, Micro- and Neuroelectronics, Sensors and Systems and the Director of the High-Density Electronics Center. He has concentrated on the design and development of various electronic, acoustic and structural composites, smart materials, structures and devices, including sensors, transducers, Micro Electromechanical Systems (MEMS), plus the synthesis and large-scale fabrication of carbon nanotubes, Nano Electromechanical Systems (NEMS), microwave, acoustic and ultrasonic wave absorbers and filters. He has developed neurostimulators, wireless microsensors and systems for the sensing and control of Parkinson’s disease, epilepsy, glucose in the blood and Alzhiemer’s disease. He is also currently developing both silicon- and organic-based wireless sensor systems with radio frequency identification (RFID) for human gait analysis and sleep disorders and various neurological disorders. He is an editor of the Journal of Wave–Material Interaction and the Editorin- Chief of the Journal of Smart Materials and Structures, as well as being an Associate Editor of the Journal of Microlithography, Microfabrication and Microsystems. In addition, he also serves on the editorial board of the International Journal of Computational Methods. He has published more than 500 journal papers and 11 books. He holds 12 patents pertinent to conducting polymers, smart structures, smart antennas, phase shifters, carbon nanotubes, implantable devices for Parkinson’s patients, MEMS accelerometers and gyroscopes. K. J. Vinoy is an Assistant Professor in the Department of Electrical Communication Engineering at the Indian Institute of Science, Bangalore, India. He received an M.Tech degree in Electronics from the Cochin University of Science and Technology, India and a Ph.D. degree in Engineering Science and Mechanics from the Pennsylvania State University, USA, in 1993 and 2002, respectively. From 1994 to 1998, he worked at the National Aerospace Laboratories, Bangalore, India. Following this, he was a research assistant at the Center for the Engineering of Electronic and Acoustic Materials and Devices (CEEAMD) at the Pennsylvania State University from 1999 to 2002. He continued there to carry out postdoctoral research from 2002 to August 2003. His research interests include several aspects of microwave engineering, RF-MEMS and smart material systems. He has published over 50 papers in technical journals and conference proceedings. 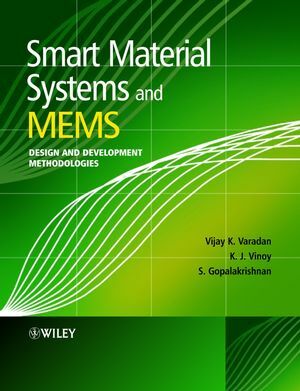 His other publications include two books, namely Radar Absorbing Materials: From Theory to Design and Characterization, and RF-MEMS and their Applications. He also holds one US patent. S. Gopalakrishnan received his Master’s Degree in Engineering Mechanics from the Indian Institute of Technology, Madras, Chennai, India and his Ph.D. degree from the School of Aeronautics and Astronautics, Purdue University, USA. He joined the Department of Aerospace Engineering at the Indian Institute of Science, Bangalore, India in November 1997 as Assistant Professor and is currently an Associate Professor in the same department. His areas of interest include structural dynamics, wave propagation, computational mechanics, smart structures, MEMS and nanocomposite structures. He is a Fellow of the Indian National Academy of Engineering and a recipient of the ‘Satish Dhawan Young Scientist Award’ for outstanding contributions in Aerospace Sciences from the Government of Karnataka, India. He serves on the editorial board of three prime international computational mechanics journals and has published 70 papers in international journals and 45 conference papers.